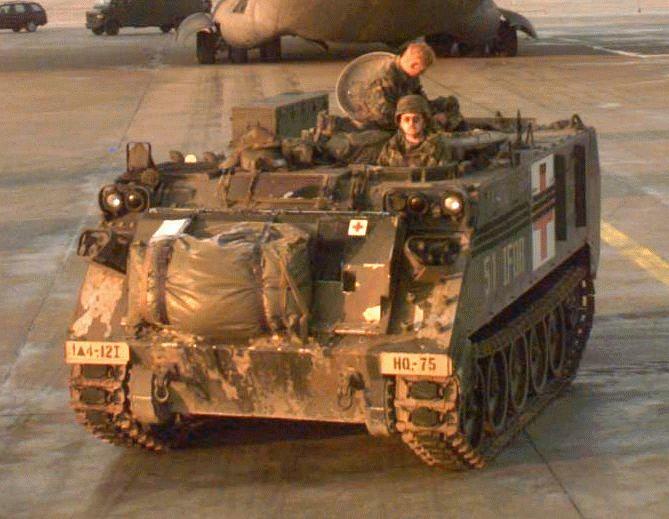 The M113A1, informally known as the Gavin, is a lightly armoured full tracked air transportable personnel carrier designed to carry personnel and certain types of cargo. 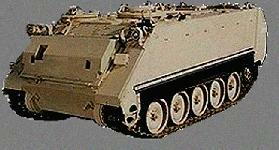 The M113-family was developed from M59 and M75 by Ford and Kaiser Aluminium and Chemical Co. in the late 1950�s. The vehicle is capable of: amphibious operations in streams and lakes; extended cross country travel over rough terrain; and high speed operation on improved roads and highways. The M113 Family includes approximately 12 variants of light armored tracked vehicles used in a variety of combat and combat support roles. Total density exceeds 28,000. Today's M113 Family of Vehicles is composed of a mix of derivative systems consisting of the A1, A2, and A3 configurations. 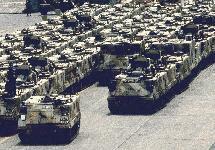 The current fleet includes: M113A2; M113A3; M106A2; M1064; M1064A3; M548A1; M548A3; M577A2; M577A3; M730A2; M901A1; M981; M1068; M1068A3; M1059; and M1059A3. Over the next 10-15 years, the majority of these systems will be converted to the A3 configuration. 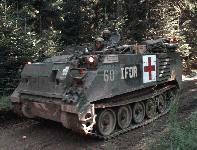 Since their initial introduction in 1960, M113-based systems have entered service in more than 50 countries. The systems have been modified into more than 40 identified specific variants, with many times that number of minor field modifications. Many of these modifications have been developed by foreign governments to meet their specific national requirements. While some older M113 derivatives are being retired and removed from selected inventories, other FOV members are being upgraded, reconfigured, and introduced as entirely new systems. More than 80,000 M113 Family of Vehicle (FOV) systems have been produced. New M113 FOV systems are being built while existing chassis are being upgraded to modern configurations. 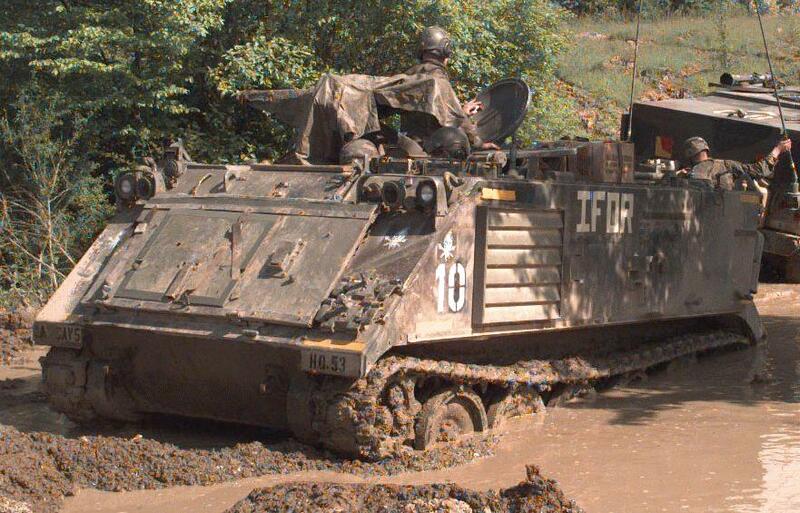 The M113 APC was the first modern "battle taxi"; developed to transport infantry forces on the mechanized battlefield. It is fitted with a 2 stroke six cylinder Detroit diesel providing power through a 3 speed automatic gearbox and steering differential. The main armament is a single .50 Cal heavy barrel machine gun, and the secondary armament is a single .30 Cal machine gun. The M113 is built of aircraft quality aluminum which allows it to possess some of the same strengths as steel at a much lighter weight. This distinct weight advantage allows the M113 to utilize a relatively small engine to power the vehicle, as well as carry a large payload cross-country. The vehicle is capable of "swimming" bodies of water. The vehicle is not mission capable if any one track shoe is damaged. If the M113 loses a track, breaks a track shoe or the vehicle throws a track, extreme caution must be exercised in maintaining control. The driver must immediately release the accelerator and let the vehicle coast to a stop. Applying braking action, i.e. brake pedal, laterals, pivot or any type of steering controls causes the vehicle to pull to the active or good track and could result in a roll-over. If it is absolutely necessary, the driver may apply braking action only, and only if the vehicle is approaching a ravine, a cliff, or if other catastrophic outcome, probably resulting in fatalities. When roll-over is imminent; it is safer to stay in the vehicle than to try to get out while the vehicle is still moving. Crew members may receive slight injuries from being thrown against metal parts, but if they try to leave the vehicle, it may roll over and crush them. Once the vehicle stops moving, the crew should get out as fast as possible because spilled fuel and oil may catch on fire. The first thing the driver should do in such an emergency is shut off the engine and turn off the master switch to minimize the fire hazard. 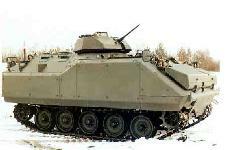 The original M113 Armored Personnel Carrier (APC) helped to revolutionize mobile military operations. The vehicles were able to carry 11 soldiers plus a driver and track commander under armor protection across hostile battlefield environments. 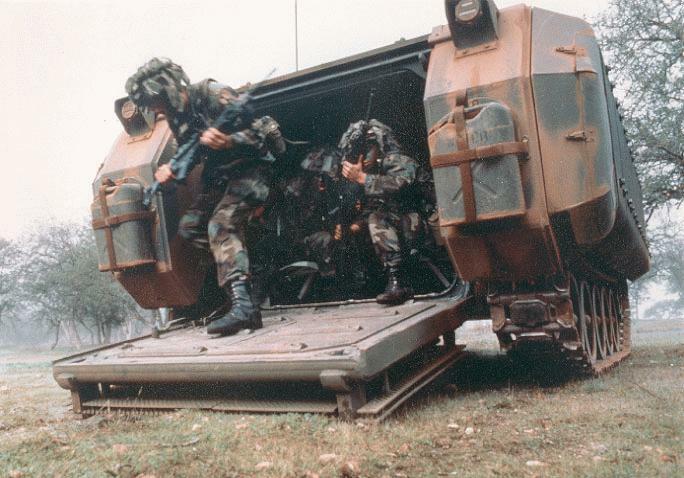 More importantly, the new vehicles were air transportable, air-droppable, and swimmable, allowing planners to incorporate APCs in a much wider range of combat situations, including many "rapid deployment" scenarios. The M113s were so successful that they were quickly identified as the foundation for a family of vehicles. Early derivatives included both command post (M577) and mortar carrier (M106) configurations. The first major upgrade came in 1964 with the introduction of the M113A1 package which replaced the original gasoline engine with a 212 horsepower diesel package. The new power train was soon incorporated into the existing vehicle family as the M113A1, M577A1, and M106A1, as well as several new derivative systems. Some of these new derivatives were based on the armored M113 chassis (the M125A1 mortar carrier and M741 "Vulcan" air defense vehicle) while others were based on an unarmored version of the chassis (including the M548 cargo carrier, M667 "Lance" missile carrier, and M730 "Chaparral" missile carrier). Continuing modernization efforts led to the introduction of the A2 package of suspension and cooling enhancements in 1979. As with previous enhancements, these upgrades resulted in further proliferation of the FOV. 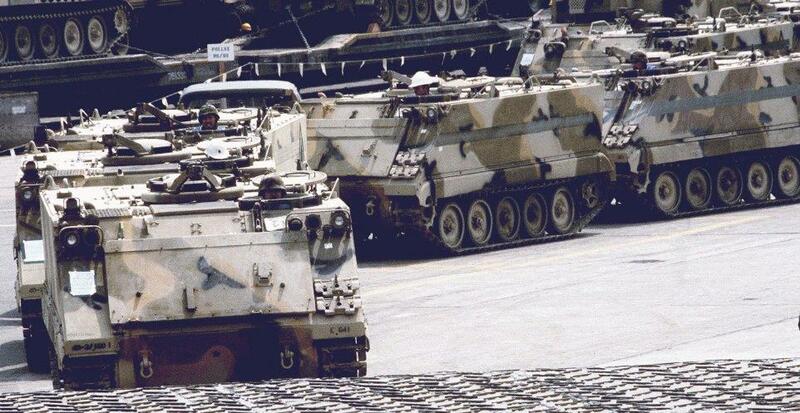 Most of the M113 family that saw service during Desert Storm were underpowered A2 level vehicles. M113A3 that were in the conflict kept pace with the Abrams equipped maneuver forces. 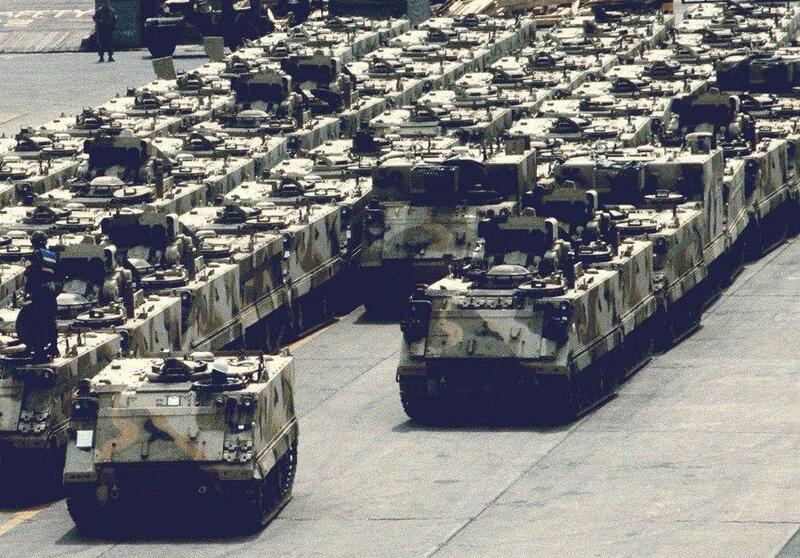 Since 1987 the PM office has been modernizing the M113 fleet to the A3. This block modification should be completed for FP1 by 2001 with current funding. Today's M113 fleet includes about four thousand M113A3 vehicles equipped with the most recent recent A3 RISE (Reliability Improvements for Selected Equipment) package. The standard RISE package includes an upgraded propulsion system (turbocharged engine and new transmission), greatly improved driver controls (new power brakes and conventional steering controls), external fuel tanks, and 200 AMP alternator with 4 batteries. Additional A3 improvements, include incorporation of spall liners and provisions for mounting external armor. The M113A3, a full-tracked armored personnel carrier provides protected transportation and cross country mobility for personnel and cargo. A light armored vehicle weighing 27,200 pounds, it carries 11 infantry personnel in addition to the vehicle driver and track commander. It is capable of sustained speeds of 41 mph on level roads and accelerates from 0 to 35 mph in 27 seconds (this compares to 69 seconds for the M113A2). The M113A3 is a product improved version of the M113A2 with improved transmission and engine. The U.S. Army first identified the need to up-power the M113A2 carrier in the mid-1970s. This need was driven by increases in vehicle weight and a requirement to increase the mobility and survivability of the system. 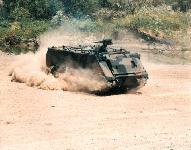 As a result, the "RISE" powertrain was developed and tested at Yuma and Aberdeen Proving Grounds. However, application of the new powertrain was deferred due to a lack of funds. 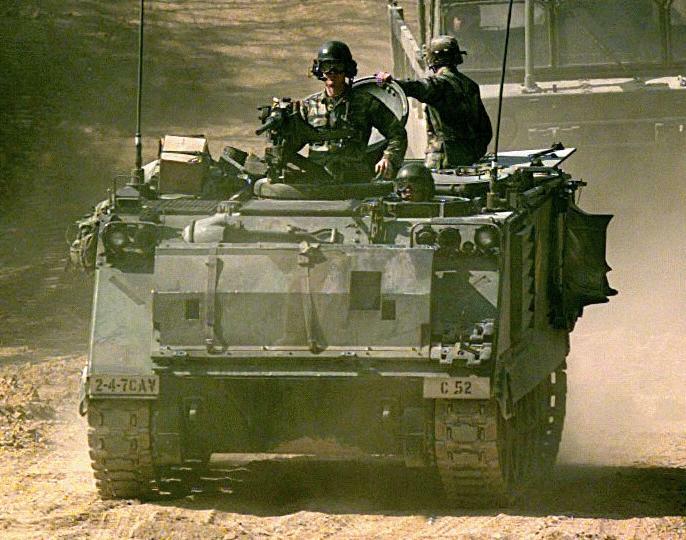 In 1984 a decision was made to incorporate the RISE package, improved driver controls, spall liners, external fuel tanks and provisions for installation of an external armor kit on an M113 chassis. Additionally, a bolt-on armor kit providing 14.5 mm ballistic protection was developed and tested. Except for the mounting provisions the external armor appliquÈ was not incorporated for production. The new X200-4/4A hydrostatic steer transmission permits use of a more powerful engine, the 275 HP turbocharged Detroit Diesel 6V53T, and eliminates the transfer case and controlled differential. The RISE powerpack increases fuel economy, acceleration, hill climbing speed and braking capabilities and allows the vehicle to maintain speed through corners by accelerating the outer track rather than braking the inner track as on the A2. The increase in horsepower also allows installation of an external armor kit (which increases the gross vehicle weight to 31,000 pounds) and provides mobility comparable to currently fielded vehicles such as the M1 tank and M2/M3 Bradley Fighting Vehicles. Steering is improved with an automotive-type steering yoke and foot brake arrangement which improves driver control, lessens fatigue and simplifies driver training from that of the A1/A2 steering/braking laterals. Due to load matching ability and increased steering capability, cross country performance is also improved. Crew survivability is increased by the addition of spall suppression liners and locating the fuel tanks externally, on the rear of the vehicle. 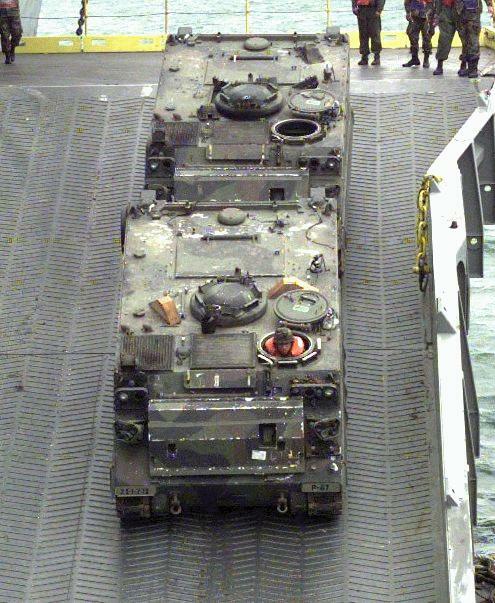 The inside of the vehicle (sides, roof and rear) are covered with spall suppression liners which limit troop injuries from the effect of overmatching weapons by restricting the spread of spall when a round penetrates the hull. External fuel tanks free up 16 cubic feet of usable space inside the vehicle and reduce the fire hazard inside the crew compartment. Two tanks and independent valving provide redundancy in the fuel system allowing continued operation when one tank is damaged. External differences between M113A2 and M113A3 include external fuel tanks and provisions for the installation of an add-on-armor kit. The M113A3 was type classified Standard. All new APC vehicles produced since 1987 and all converted vehicles since 1989 are the A3 variant. Vehicles have been fielded both in the U.S. and in foreign countries. 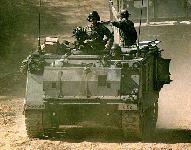 The M113A3 was initially fielded in 1987 and U.S. production of new M113A3s was completed in 1992. 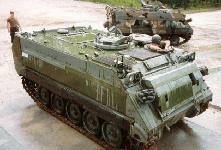 M113A3s are currently being produced for Thailand as a direct sale. 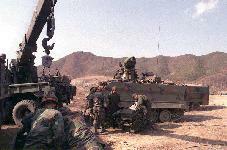 Conversion of M113A2 vehicles to M113A3 vehicles has been underway at United Defense, L.P. since 1994. 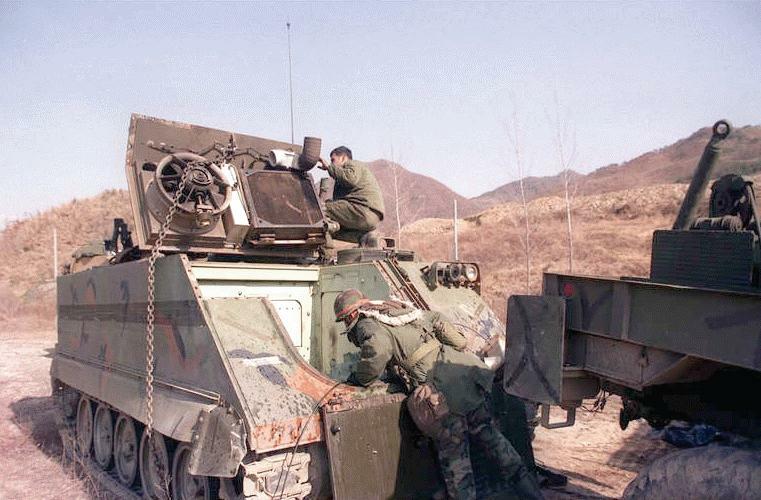 Previously, conversions of M113A2 vehicles to M113A3 vehicles were completed at Red River and Mainz Army Depots, as well as in Korea. The future M113A3 fleet will include a number of vehicles that will have high speed digitial networks and data transfer systems. The M113A3 digitization program supports the Army's Modernization Plan by applying applique hardware, software, and installation kits and hosting them in the M113A3 FOV. 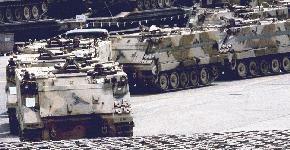 Current plans call for these systems to be integrated into the M113A3 FOV by the year 2006. Braking (20-0 mi/h) 40 ft.
50 cal MG 2,000 ready rds. Tomorrow's track combat vehicles will need to transit battlefields quicker, carry heavier loads, provide crew and equipment with increased protection and meet the digitization requirements of Force XXI and the Army After Next. Government and industry planners are looking at a number of initiatives to help insure these future capabilities in the M113A3 family of vehicles systems. The force structure for 21st century armored forces will keep much of the existing track combat vehicle fleet that are in the Army today. The challenge for tomorrow's Army will involve making the best use of future funding to improve capabilities and reduce limitations of the current vehicle inventory. Due to its durability, low cost, and light weight, the M113 design is an ideal starting point for development of future light weight vehicles. Concepts ranging from rear drive M113 vehicles, to composite hulled turreted vehicles, to low observable alternatives are all possible given the baseline M113 chassis and components. Recent M113 concepts for the future include: the XM1108 Universal Carrier, the M113A3 High Mobility System, and the M577A3 "Stretch". These concepts, as well as other ongoing upgrade initiatives, provide the foundation for future modernization and the continued viability and utility of M113-based systems. Regardless of the need and the timeframe involved, these concepts provide an effective, viable alternative to a new start production program for the chassis. This allows program funding to concentrate on maturing the target acquisition, survivability, low observable, and communications technologies needed. The M113A3+ mobile tactical vehicle light (MTVL) uses an M113 hull that is lengthened 34 inches and equipped with an additional road wheel (six on each side). The vehicle was developed as a "production-tooled demonstrator" with private-industry funding from United Defense. The M113A3+ ESV is the only affordable solution that meets the Combat Engineer Squad requirements to transport an eight man engineer squad and all of their equipment while providing mobility and survivability equal to the maneuver force. The M113A3+ ESV supports the Engineer Squad in the performance of both offensive and defensive obstacle/counter-obstacle operations in support of the maneuver force. The vehicle can be adapted to fulfill other engineer mission objectives including: carrying the Volcano mine dispenser, the pathfinder marking system, and towing the MICLC trailer. The approved System Acquisition Strategy (SAS) calls for fielding 332 units to fill out Force Package I Engineer units. Depending on funding availability, First Unit Equipped (FUE) is projected for FY00. As M113 FOV carriers become excess in the military system a number of conversion options are being considered for asset utilization. United Defense L.P., working with NASA/AMES, has developed the Hazardous Materials Recovery Vehicle (HAZMAT), as one such use for these excess assets. The HAZMAT vehicle utilizes a Stretch M577A3 hull structure incorporating a light dozer blade and a hydraulic manipulator arm. The vehicle provides a versatile chassis for hazardous material recovery operations. The HAZMAT has been designed to retain the air transportability features of the M113 FOV, with C-139 roll-on/roll-off capability. In addition the HAZMAT is being designed to include an over-pressure closed circuit life support system, radiation shielding, a HAZMAT suit docking feature, and a high visibility chemical agent resistant finish. The HAZMAT retains the M113 FOV mobility characteristics to support recovery operations in all terrains. Infantry Fighting Vehicle Light (IFVL) is a light infantry fighting vehicle based on the proven MTVL chassis and featuring a one-man stabilized turret is convertible from existing assets or available as new production. It offers the exceptional automotive performance of the MTVL chassis combined with the substantial firepower of the stabilized 25mm chaingun and 7.62mm machinegun. The vehicle is powered by a 400hp 6V53TIA electronically controlled engine driving through the latest X200-4B cross drive transmission. 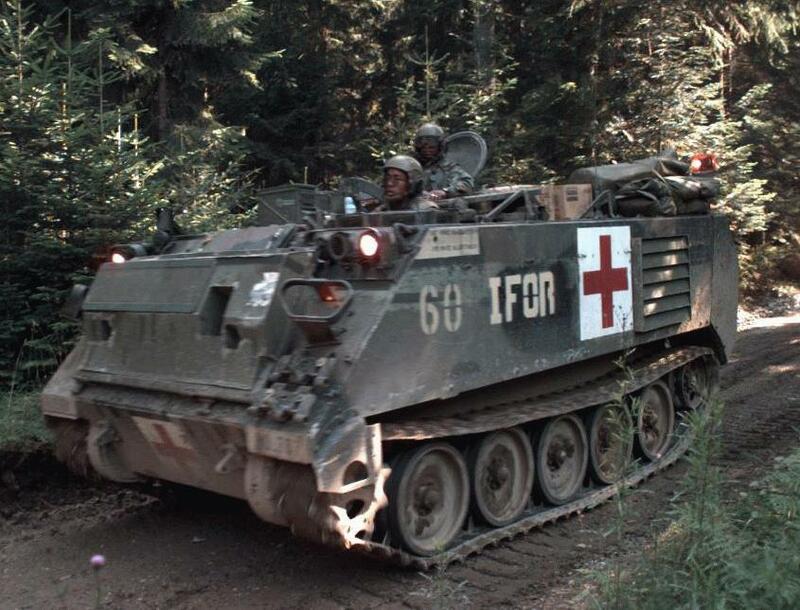 The IFVL uses many common M113/MTVL components that help insure high reliability, availability, and maintainability, plus a proven design, common maintenance techniques and an established logistics infrastructure. Applique armor provides the flexibility to alter the armor package as the threat level changes or technology advances. The vehicle carries a crew of two or three and up to 10 dismount soldiers. As with all M113 variants,it is roll-on/roll-off transportable on a C130.